Protesters clench their fists during a rally at the Lower House to coincide with the joint Senate and Congress vote for the third extension of Martial Law in southern Philippines, Dec. 12, 2018 in suburban Quezon city northeast of Manila. 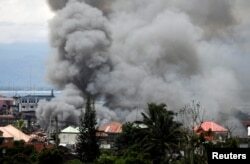 The Philippine Congress on Wednesday approved a request by the president to extend martial law in the country's volatile south by a year due to continuing threats by Islamic State group-linked militants and communist insurgents. FILE - Philippines President Rodrigo Duterte gestures while addressing police force to mark the 117th Philippine National Police Service anniversary at Camp Crame in Quezon city northeast of Manila, Aug. 8, 2018. "Now more than ever, we cannot afford to show our enemies a moment of weakness in our resolve to defeat them," Executive Secretary Salvador Medialdea told the joint session of Congress. He warned that if Muslim militants and communist insurgents are allowed to regroup, "this government will not be able to function fully, basic services to the people will continuously be hindered, and the safety of the general public will remain to be under constant threat." 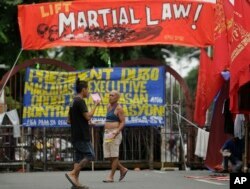 Opponents argue that extending martial law is unconstitutional because it is an "extreme measure" that can only be imposed when an actual rebellion against the government exists. They say the move could be a prelude for Duterte to declare martial law throughout the Philippines. FILE - Filipino activists protest near the Malacanang Presidential Palace in Manila, Philippines, July 20, 2017, against Philippine President Rodrigo Duterte's proposed extension of martial law in the whole of Mindanao island until the end of the year. Opposition Rep. Edcel Lagman said the government's repeated requests for extensions of martial law show the military and police have failed to achieve their objectives under martial rule. "I think this undue prolongation of martial law in Mindanao would amount to perpetuity," Lagman said. Defense Secretary Delfin Lorenzana pledged that the military will protect "the democratic way of life of our people, with full respect for human rights, international humanitarian law and the primacy of the rule of law." Filipinos remain hypersensitive to threats to democracy and civil liberties after they ousted dictator Ferdinand Marcos in a 1986 "people power" revolt that became a harbinger of change in authoritarian regimes worldwide. Marcos declared martial law in the Philippines in 1972 in a period marked by massive human rights abuses. 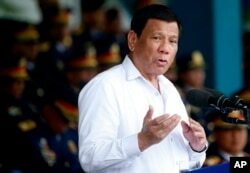 Concerns over Duterte's martial law have been sparked in part by his perceived authoritarian bent and the killings of thousands of suspects in a crackdown on illegal drugs that he launched after taking office in 2016.